Hoping there won’t be any nibbling!! It is heartwarming to hear of the connection you have made and I totally understand how you feel about the joy of these new friendships. Blogging and the interaction and feedback I find I can rely on through my blog has changed my life- for the better! It is truly amazing. So please don’t apologise, I an cheering for you from my sunny garden! The squares are lovely……especially the daffodil and to make such special things just for you is truly special. Kind Regards, Karen. There’s going to be an outbreak of them in west Wales!! 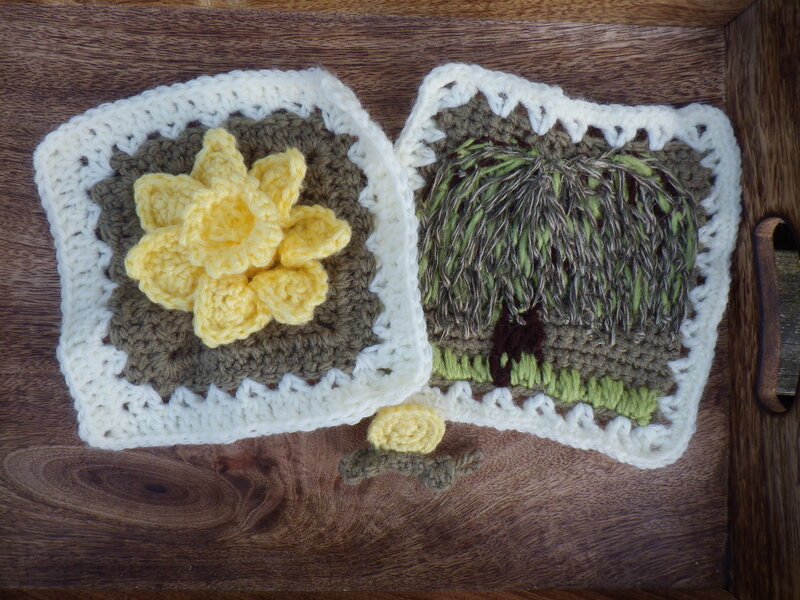 That willow square is fantastic, so is the daffodil one. The willow square is knitted ? The willow square is crochet with the tree sewn over it. I love them both. Thanks for that info. love that willow tree, its come out beautiful. That’s care in the community for you! Must remember to put the kettle on next time we Skype! Just got back today, nearly dead after three consecutive nights spent on a plane, but I have Easter to recover in. Talk to you soon! Sleep well for the next few days! Just woke up at the usual after a good solid night. I think we may actually be OK. We’ll be forced to take it easy, as it’s now the Easter holiday weekend! Talk to you soon.